AMT offers a wide range of products and implementation strategies for upgrading and modernization of our customers’ lines. Starting with the “mere” replacement of the control software and the related computer technology via the additional replacement of the subsequent I/O module hardware right up to a complete solution including the replacement of the switchboards – we offer the tailor-made solution for upgrading your line control to an up-to-date technology independent of your need of innovation. Field bus systems for signal output and signal input are default for new lines. At the same time, we have the ability to connect our control system to any old system regardless of the type. We do not shun any challenge in the field of control technology. Please contact us! We would like to send further info material and explain in detail what possibilities are at your disposal and how to realize your desired control system. There are manifold requirements to a modern control system. Some easy to understand main requirements result in a number of deduced detail requirements. We explicitly take account of each of these requirements by way of the range of functions of our control system. We achieve a high degree of availability by optimal usage of the production time, e.g. process and entry optimization as well as by minimizing production downtimes due to planned or unintended measures. 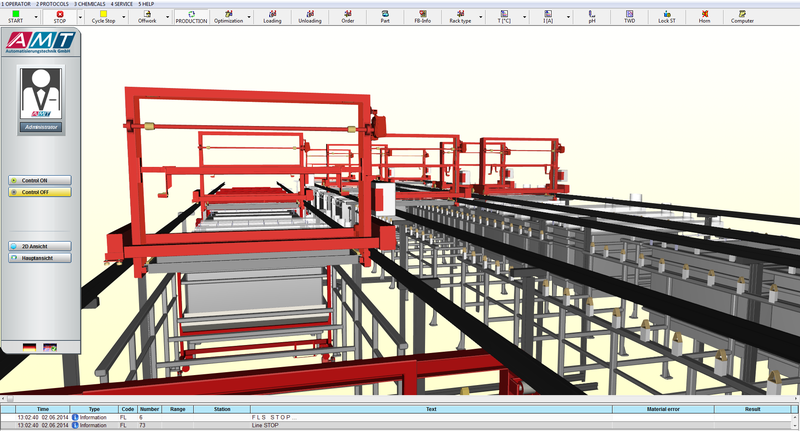 Planned downtimes of production comprise maintenance measures, updates and reconstructions. Unintended interruptions of production occur because of damages, failures, technical breakdown and malfunction. At cycle-bound lines, our drive sequence control avoids any unintended empty cycles during production. Production downtimes are minimized by our system of partial switching-off. At this, only those parts of the line are temporarily decoupled from automatic mode that have to be modified; the remaining production continues unchanged. This is valid for maintenance measures, for short-time interventions for trouble-shooting, for the assessment of the product or the production facilities. Maintenance measures can be planned strain-controlled or wear-and-tear-controlled. The necessary data are delivered by our integrated runtime monitoring, and the maintenance-planning module generates corresponding information for the user, if and only if the real strain, tear, and wear of the respective line parts require maintenance. This way, production is interrupted only as long and as often as absolutely necessary. Apart from the actual standstill times, production downtimes comprise the times for stopping and re-starting the line to full production mode. Since we do not depend on special bath occupancy or on special positions and states of the transport equipment for re-starting the line, it can practically be switched out of every state to production mode. Corrective drives are automatically determined and executed. This saves time for stopping and re-starting production since there is no need to wait for reaching basic position, for example. Our built-in tools for an accelerated fault finding reduce production downtimes in case of error to a minimum. Two-dimensional and three-dimensional aggregate images give a realistic impression of the moving state of the respective aggregate as it presents the control due to the read sensor signals. Sensors and signal generators are displayed at the installation place together with their actual signal state. Thus, signal chains can be checked, signal states can be verified and error causes can be detected faster. operating sequences are clear, logically structured and straightly displayed in the control system. frequently occurring operating tasks can be executed by only few inputs and mouse clicks. recurrent operating sequences can be combined and retrieved at push of a button. the control interface is ergonomically structured according to generally accepted standards. In our control interface, a possibly realistic and precise graphic display triggers the elements to be controlled. Operators find quickly and in a simple manner what they want to control by mere showing instead of cumbersome naming and explaining. An alphanumeric display shows all data necessary for controlling and viewing. All aggregates and sensors to be controlled are connected to individual control panels that can be used to set operating modes, switch states and configuration values and to query operating states and events. In addition, there are tabular overviews for everything to get a quick overview and to change configuration data quickly, and to conveniently, simultaneously switch several aggregates. 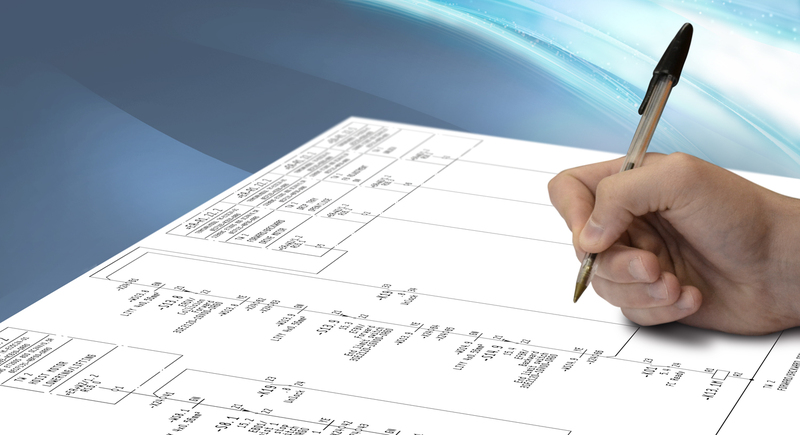 Traceability is the first condition for process analysis and quality assurance. 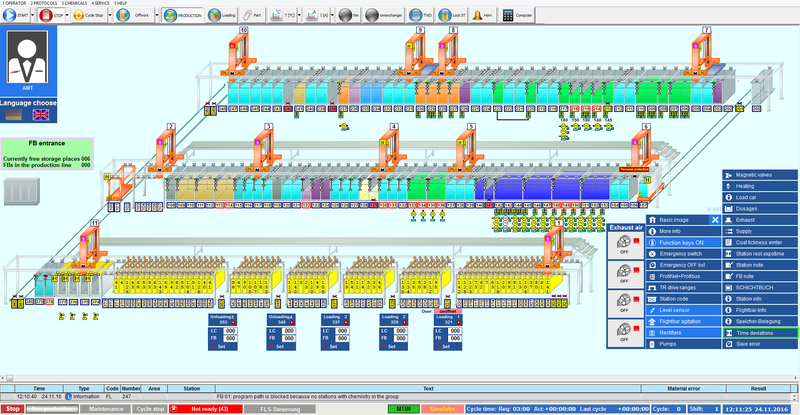 Here we offer uninterrupted traceability of instantaneous values of process variables by visible and permanently updated display of measuring values, long-term recording of process variables trends via trend curves (data logging) and histograms, comprehensive alarm message and recording system, creation of protocols on the plant performance and throughput in different formats, e.g. due to produced bathes, partial charges, flightbars, number of articles, weight, surface. Wear and tear, maintenance requirements, strain of equipment can be traced in a Runtime protocol and a Consumption protocol where switch cycles are counted, operating times are summed-up and the consumption of chemical media, anodes and auxiliary material is recorded. A protocol output system makes this considerable amount of data available to the operator. Search, sort and filter functions are used for the respectively wanted, selective data view. Thus, even large data volumes become clear and manageable. For subsequent processing, the protocol outputs can be exported in common formats when either required or automatically, periodically repeated for the exchange of data with the customers’ EDP systems. Establishment and preservation of security certainly belong to the far-reaching and most important issues in automation and control technology. Plant manufacturers and plant operators have to take a wide range of precautions to ensure security. Here, security means primarily to avoid, to avert and to minimize potential risks and damages to persons and equipment. The detection of entering hazardous areas and emergency OFF concepts are the key security measures to protect the life and health of humans in and around production plants. In the field of switchboard construction and in the conception and realization of the complete electrical system of the plants, we together with the line manufacturer make our contribution to fulfilling the legal provisions and beyond. Yet, we define security as a task for the control in a wider sense. Take, for example, operating security as protection against improper operation. Generally, user inputs are checked for plausibility in order to avoid unreasonable inputs. Detailed graphic displays of aggregates and sensors as well as schematic drawings, flightbar and article photos help to avoid confusion. Access security means protection against unauthorized access. Password-protected, graduated access restriction clearly determines who may access which parts of the program. Automatic, time-controlled logout closes “forgotten” accesses and prevents misuse. Failure safety is the obligation to prevent plant downtimes and production losses. Data security means protection against loss of data; for this, we use automatic backups and data mirroring. Finally, reaction reliability means protection against the omission of important actions. Our control communicates with the operator via an information system with text messages on screen or printer, SMS messages, horn or lamp signals or in a visual symbolic or illustrative manner. Naturally, messages to the operator are recorded and in case acknowledgement is required, so this acknowledgment will be recorded incl. date, event and name of the confirming person. This is another safety aspect: to ensure that all events and reactions of the operating staff registered by the system can be traced back later for a reconstruction of the course of events.